God says, "Follow me." But we can think of a million excuses. Were not smart enough, big enough, trained enough, capable enoughthe list goes on and on. But God sees us through the filter of grace and calls us "enough" in Christ. The God of the Biblewho empowered Abraham, Moses, Esther, and othersis still calling and equipping us today. 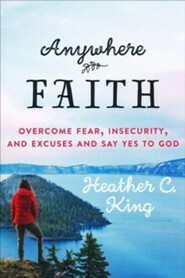 Walk with Heather C. King as she relates humorous and practical stories from the lives of Bible heroes, as well as her own life, to see that following is about obedience, relationship, and just saying "Yes!" to God. 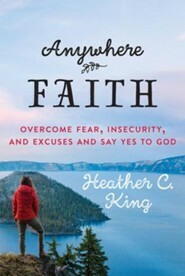 Heather C. King is a Bible study teacher, womens ministry leader, and blogger with a desire to help others apply Gods Word to the clutter, noise, and busyness of everyday life. Heather lives in Virginia with her husband and four children. I'm the author/artist and I want to review Anywhere Faith: Overcome Fear, Insecurity, and Excuses and Say Yes to God - eBook.